LotusOpening News |: No Apology to 1st Lieutenant Dan Choi.....!! Are You Fed up? No Apology to 1st Lieutenant Dan Choi.....!! Are You Fed up? 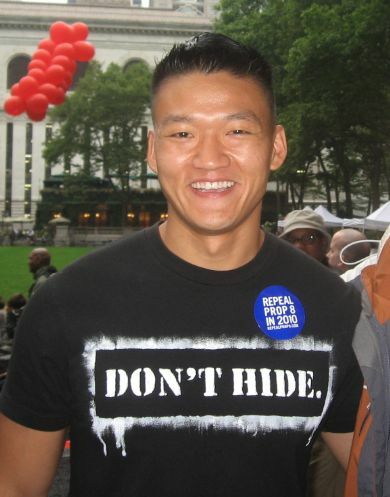 1st Lt. Dan Choi has been discharged for refusing U.S. military and government coercion to lie about his being a homosexual man. Shirley Sherrod has been offered a promotion and has received a phone call apology from the President for being abused by bigots who falsely accused her of being a black racist. Both Dan and Shirley are Americans who have stood for truth, and added to our country's integrity. But Dan - only because he's homosexual - is the one who has lost his military career, with no apology from President Obama. President Obama has the capacity to be a great leader. He needs to lead and stop giving deference to the bigots. These religio-bigots are telling all GLBT Americans to shut the f*ck up and be grateful that we haven't been incarcerated or executed, because that's what we really deserve! They threaten us from coast to coast with their stillborn, inhuman statutes made specifically for us, backed by threats of jail time and fines, enforced by government executive powers from the federal to the local levels. They are denying us our American God-given freedoms. They are depriving us of our humanity and joy of life in the United States. They are withholding recognition of our families, and are destroying our families. They are putting our innocent, dearly loved foreign-born family members into detention prisons and deporting them into other countries; sometimes into life threatening situations. They are overtaxing us and pushing us into poverty, loneliness, dysfunction and misery, to force us to eat our "sin of homosexuality". They are forcing us to comply with a U.S. government sponsored and backed religion. And finally, after endless petitions, pleas, and screams for help, the bigot-infested government of the United States is still in effect, turning a deaf ear to us - refusing to redress our grievances, and even persecuting us - for exercising this critical right guaranteed by the First Amendment to our Constitution! The assault on Dan is an assault on me, and it is an assault on all GLBT Americans and our allies! How many of us are FINISHED with this medieval mob? We need President Obama and our allies in Congress to lead, now!